The 3M TR-300-HIK has been replaced by the upgraded 3M TR-300N+HIK. Click Here to view the 3M TR-300N+ HIK. 3M Versaflo Heavy Industry Powered Air Purifying Respirator (PAPR) Kit, TR-300-HIK PAPR Systems, (Powered Air-Purifying Respirators), help to defend against chemical, biological, radiological and nuclear (CBRN) agents which is an important safety in protecting yourself against harmful hazards. The National Institute for Occupational Safety and Health (NIOSH), in addition to the U.S. Army Soldier Biological and Chemical command (SBCCOM) and National Institute for Standards and Technology (NIST) continue to promote assurance of safety by continuous developments and testings which include appropriate standards & procedures for all classes of respirators. Standards development efforts have come up with a CBRN standard for Powered Air Purifying Respirators (PAPR) which 3M has focused putting the best technology together to not only create a PAPR system you need, but the insurance you expect. Versaflo is 3M's smallest and lightest belt-mounted PAPR system ever! Versaflo's slim profile and contoured design are perfect for use in tight spaces.The one-button operation, quick and easy battery and filter change, and low battery alarm make this PAPR system user-friendly. 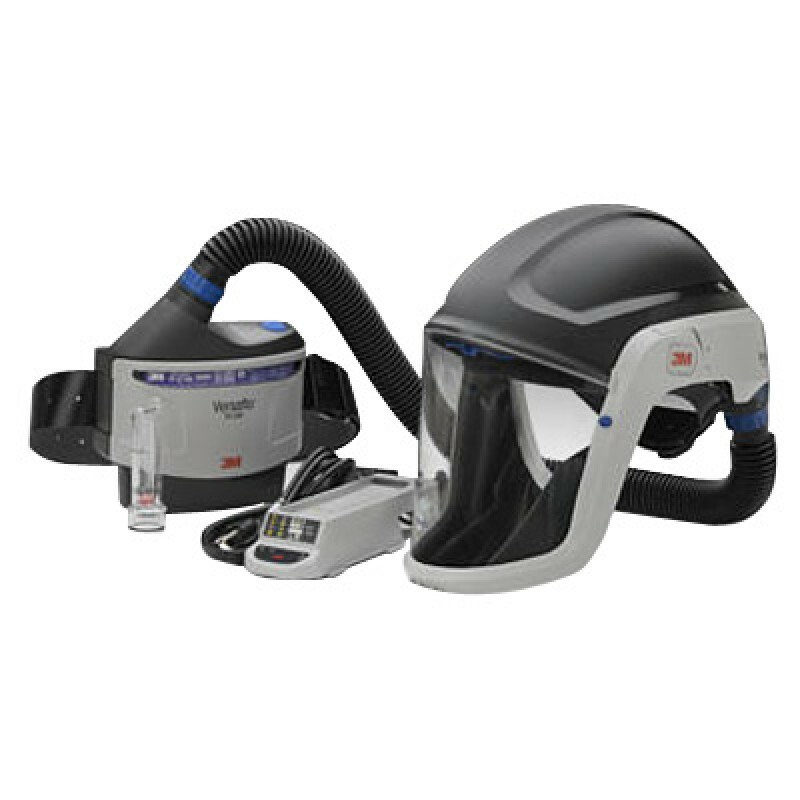 This Heavy Industry PAPR Kit combines respiratory, head, eye and face protection all in one. The hard hat style helmet features a premium visor and faceshield. The heavy duty neoprene breathing tube and leather belt are exceptionally durable to withstand harsh conditions. Ideal for industrial applications that require head, face, eye and respiratory protection.